Ticketmaster have warned music and sporting fans to be on the lookout. IF YOU’RE ON the way to a major musical or sporting event on these shores in the near future you’ll need to be vigilant – there’s a lot of dodgy tickets doing the rounds according to wholesaler Ticketmaster. Tickets are big business at present, with the re-sale market on sites like Gumtree particularly popular when it comes to events of all shapes and sizes. Now, with the likes of a sold-out All Ireland semi final and Electric Picnic (for which tickets are like gold dust) on the way in the near future, scam artists are using the opportunity to take advantage and make hay. “We have seen a number of people very disappointed when they were turned away from recent shows because their tickets were fake,” said Keith English, managing director of Ticketmaster Ireland. 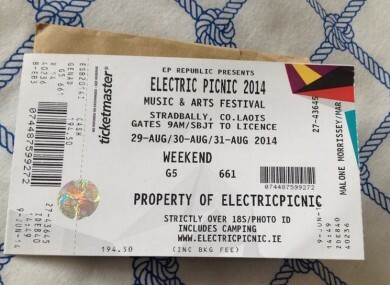 For Electric Picnic in particular, fans are reminded that the event is completely sold-out and that no ‘Print at Home’ delivery option was given when tickets were originally on sale. “We would urge fans to only buy tickets from official sources otherwise they cannot be sure whether the tickets are genuine or not,” says English. They could end up having their day ruined when they are refused entry to the event and be at the loss of their money as well. English added that Ticketmaster are working closely with gardaí to combat the problem of fake tickets. A Garda spokesman would not be drawn on the issue in detail, but told TheJournal.ie “as always we would recommend that people buy their tickets from recommended retail outlets”. Email “Keep your wits about you - there are a LOT of counterfeit tickets to big events doing the rounds”. Feedback on “Keep your wits about you - there are a LOT of counterfeit tickets to big events doing the rounds”.